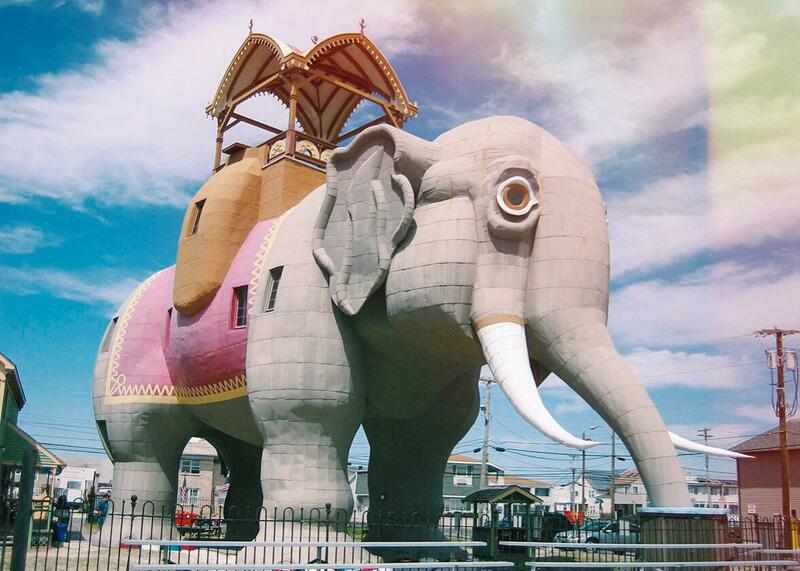 “World’s biggest” roadside attractions: a history of “world’s largest” tourist traps. What was the world’s first “world’s largest” roadside attraction? 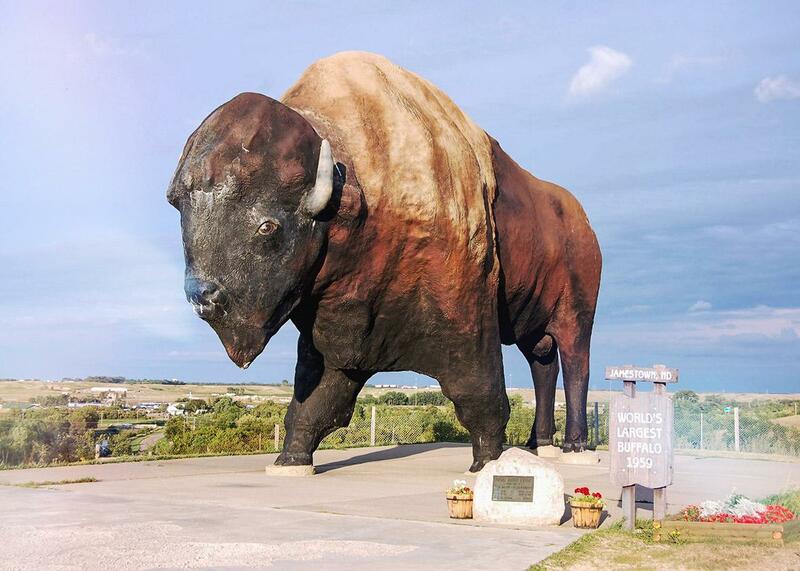 The World’s Largest Buffalo, seen here on Aug. 24, 2009, can be seen from I-94, and is nicknamed Dakota Thunder. It is located in Frontier Village in Jamestown, North Dakota. If you’ve spent much time making long road trips across America, you’ve probably noticed that its highways are dotted with “world’s largest” attractions: oversized replicas of ordinary objects meant to entice travelers to pull off the road. When did enterprising businesses start building these tourist traps? What was the world’s first “world’s largest” roadside attraction? Lucy the Elephant, if we’re to judge from the U.S. Patent and Trademark Office. Mankind has been building colossi on the sides of roads (and on the side of Rhodes) since at least the second millennium B.C. But the idea of building a superlatively large object as a publicity stunt to attract tourists is a uniquely American innovation, and its founding father is James V. Lafferty. In 1881, Lafferty found himself the owner of a stretch of undeveloped land just south of Atlantic City, New Jersey. When he wanted to attract land buyers and raise his property values, he struck, naturally, upon the idea of building a giant elephant as a publicity stunt. (Perhaps he was inspired by the Elephant of the Bastille, which had been built by Napoleon for the different purpose of marking his accomplishments.) The $38,000 stunt worked. Soon he was auctioning off land from the howdah perched atop Lucy, and the “world’s largest elephant” would go on to be visited by the likes of President Woodrow Wilson. In 1882, Lafferty filed a patent on giant buildings “of the form of any other animal than an elephant, as that of a fish, fowl, etc.” which notion he claimed was his invention. Though it’s hard to say whether any earlier “world’s largest” attractions might be lost to history, experts on “world’s largest” attractions usually point to Lucy as the original. This is Lucy. She started life as a hotel in Margate, New Jersey. She now is a tourist attraction in that same town. Photo by Jim McIntosh/Flickr Creative Commons. A few more “world’s largest” attractions were built between the introduction of Lucy and the invention of the Model T—see, for example, “the world’s largest hand-dug well,” built in 1888, and the 12-foot “biggest chair,” erected in Gardner, Massachusetts, in 1905—but the golden age of “world’s largest” attractions began in the 1920s. With the rise of highways like Route 66 (established in 1926), small towns and shops had to figure out how to catch the eyes of motorists who were only passing through. Sometimes the answer was “mimetic architecture”—buildings built in the shape of the products the owners were selling. Californians began selling oranges out of giant orange-shaped buildings. Washingtonians and Pennsylvanians served coffee in giant coffee pot–shaped buildings. And Long Islanders sold eggs out of the Big Duck. Some of these were named the world’s largest and became attractions in themselves, such as Alabama’s “World’s Largest Bottle,” out of which Alabamians sold soda and groceries, and West Virginia’s “World’s Largest Teapot,” built in the 1930s. (“The Bottle” proved more flammable than the product it was modeled after, and it apparently burned down that same decade.) Soon, there were hot dog–shaped hot dog stands, which were quickly complemented by the “World’s Largest Catsup Bottle,” completed in 1949. In the 1950s, when Guinness World Records started publishing its books, small towns started to compete over who could take a given substance and build the world’s largest ball of it. Nebraskans began to build the world’s largest ball of stamps. Meanwhile, Kansans and Minnesotans started what would become a decades-long battle over who could build the world’s largest ball of twine. In later decades, similar struggles would erupt over who could build the world’s largest ball of rubber bands, the world’s largest ball of tape, and the world’s largest ball of barbed wire. 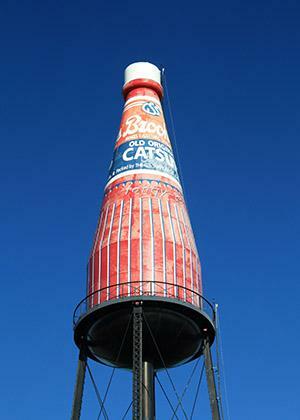 The World’s Largest Catsup Bottle, Collinsville, Illinois. Though American in origin, “world’s largest” attractions went global in the 1960s. Soon, Australia and then New Zealand—two other young nations with sprawling open spaces—began building their own supersized attractions. However, they gave them the slightly more modest name big things. Among Australia’s many big things are the Big Pineapple, the Big Lobster, and the more satirical Big Poo (which was built in protest of a plan to dump sewage nearby). Meanwhile, New Zealand has such nationalistic big things as its Big Kiwis and Big Kiwifruit. As you might suspect, some items’ claims to being the “world’s largest” aren’t 100-percent truthful. For example, as the Village Voice noted in 2010, there are about six different frying pans claiming to be the world’s largest, and a similar dispute has arisen over who owns the world’s largest rocking chair. It seems that, while many countries erect big things, only Americans dare to claim that theirs are the biggest. The Travel Explainer thanks Erika Nelson of the World’s Largest Collection of the World’s Smallest Versions of the World’s Largest Things.